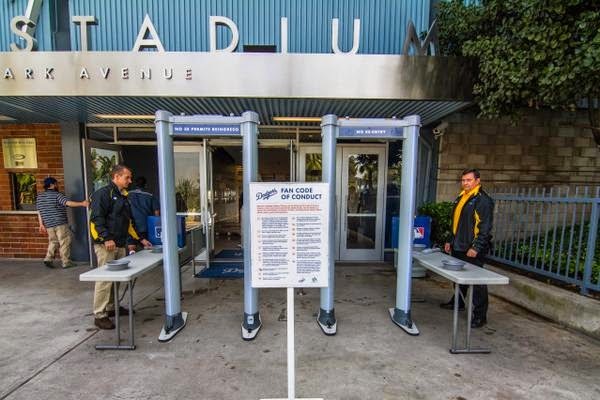 GETAWAY DAY: The Dodgers take on the Royals today in Surprise in their Arizona exhibition finale, with many of the regulars having already made their way back to Los Angeles ahead of tomorrow’s Freeway Series opener in Anaheim. 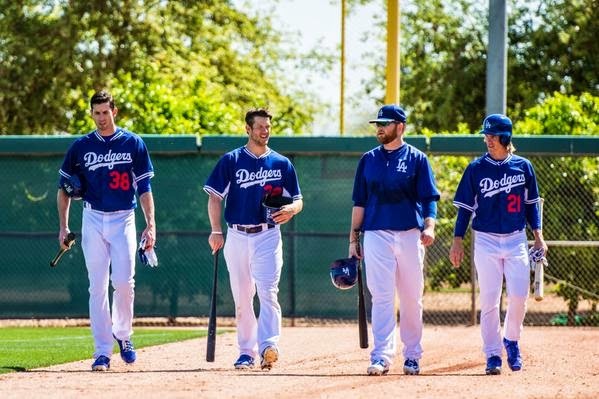 Yesterday, the Dodgers wrapped up a 15-game slate at Camelback Ranch - Glendale, establishing records in both total attendance (147,066, besting previous high of 136,944 set in 2009) and average attendance (9,804, beating 2014 average of 9,534). In its seventh season playing at Camelback Ranch, the club posted four sellouts and eight of its 15 home games drew crowds of more than 10,000 fans. Los Angeles has the National League’s top winning percentage this spring at .640 (16-9-6) and has already established a record with six ties. This is not an April Fool’s Joke, Opening Day is just FIVE days away! 90 FEET AWAY: The Dodgers came up just short yesterday, leaving the tying and winning runs in scoring position in the ninth, and fell, 2-1, to the White Sox at Camelback Ranch. Chris Heisey’s fifth-inning home run provided the Dodgers’ lone run in support of starter Joe Wieland, who took the loss after allowing just two runs in 5.0 strong innings. Yimi Garcia struck out the side in the eighth inning and has allowed just one run, while striking out 12, in 9.1 innings this spring. B.A.T.-TER UP: On Monday, the Baseball Assistance Team (B.A.T.) announced that more than 1,400 players, coaches and managers for all 30 MLB clubs collectively pledged a record donation of $2,643,195 to the organization, which is dedicated to confidentially assisting members of the baseball family who are in need with nowhere else to turn. Additionally, the Dodgers (NL) and Tigers (AL) were recognized as the recipients of the Bobby Murcer Award for their generosity and committing the most money to the charity. It’s the fourth time that the Dodgers have won the award (also: 2010, 2011, 2013). FOLLOW THE CACTUS LEADERS: The Dodgers have blasted a Major League-leading 46 home runs (three more than the Cubs’ 43) and have a .286 team batting average (3rd, NL) with a .487 slugging percentage (2nd, NL) this spring. Joc Pederson continues to rank among the NL leaders this spring in batting average (.368, 6th), slugging percentage (.754, 1st), hits (21, T-5th), runs (13, T-2nd), total bases (43, 2nd) and home runs (6, T-2nd). Justin Turner has hit safely in 15 of his last 16 games and is batting .477 with six doubles, three homers and eight RBI, while posting a .500 on-base percentage and a .818 slugging percentage in 18 Cactus League games. Turner’s 21 hits this spring tie for fifth-most in the NL. Yasiel Puig ranks among the NL’s best this spring in home runs (5, T-4th) and RBI (13, T-10th); Kiké Hernandez places among the league’s best in home runs (5, T-4th) and runs scored (12, T-6th). HAPPY HAPPY! 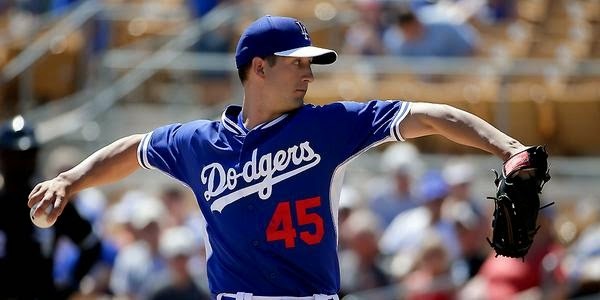 : The Dodgers would like to wish a very happy birthday to Chris Withrow, who turns 26 today! Withrow will start the season on the 60-day disabled list as he continues to rehab from Tommy John surgery and offseason back surgery. ON THE MOUND: LHP Clayton Kershaw will make his final start of the spring today and is expected to throw about 45 pitches. The 27-year-old last pitched on Sunday against the White Sox, allowing just one run on four hits and striking out eight in 6.0 innings and will make his fourth consecutive Opening Day start on Monday against the Padres. Kershaw is the only pitcher from big league camp heading to Surprise today and will be followed to the mound by minor leaguers. Zack Greinke will make his final tuneup of the spring this morning in a minor league intrasquad game, expected to start at 10:00 a.m. on Field 1 at Camelback Ranch.